Towell Drilling & Oilfield Services Co.
Musandam Mineral & Industrial Co.
General Electric & Trading Co.
Oman's economy is maturing and the role of the private sector is growing in importance. Towell Group of Companies is committed to the national goals of diversification and to broaden the industrial base and expand in a range of areas. Throughout history, each generation of the Sultan family has left its mark. The current directors' efforts are aimed at achieving projects that may be looked upon by future generations as milestones in the development of the country. Towell Group of Companies is today one of the largest companies in the Sultanate and comprises of seven clusters with members on the board from the fourth and the fifth generation of the Sultan family. The clusters are; Enhance, Engineering, Construction, Property, Services and Trade, Consumer Product Division (CPD) and Automotive. This cluster includes several companies in which Enhance is the leading provider of brand distribution and retail management solutions in Oman with expanding management responsibilities in other GCC markets. The engineering cluster is involved in carrying out Engineering Procurement Construction (EPC) and construction projects for the oil & gas industry, petrochemical, infrastructure and power industries etc. The cluster also represents renowned manufacturers and supplied engineered products to various market segments in the country. The group's construction arm has moved into taking up competitive third party projects along with the ongoing in-house property developments. Whether building land mark structures such as the new Supreme Court and the Civil Aviation head quarters, Industrial plants like the Vale steel pelletizing plant or warehousing solutions to fit business needs and high end residences and villas - Towell Construction is a trusted name across a host of construction needs in the Sultanate. Real estate is one of the core businesses and major assets of WJ Towell group. Many of extensive properties hold valuable re-development potential currently in the planning and design stages. 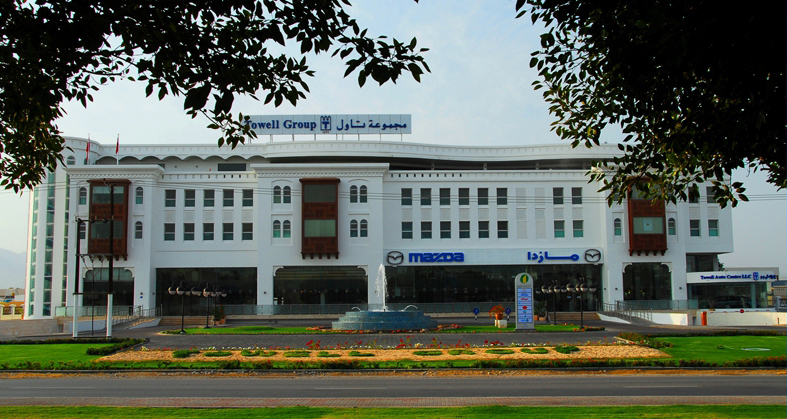 Towell Property provides premium commercial, residential, warehouses and staff camps real estate solutions in Oman. WJ Towell has a vast distribution network as a leading consumer goods distributor. The Group is positioned to provide the most thorough and cost efficient distribution in Oman and aware of the changing nature of traditional agency services. The Group is also directly involved in manufacturing paints, furnishings, pet bottles and building materials including concrete and fiber glass pipes. The Automotive cluster also participates indirectly in the quarrying, engineering and through a number of small shareholdings in local enterprises.